The cost of hangar rent is too high. One of the reasons that I bought the Kitfox was for its ability to be stored at home and easily transported to the airport. To take advantage of the folding wings, I needed a trailer. I found out about a trailer for sale on the Kitfox Builder's internet newsgroup. It had been built by Vic Jacko for his Series 5 in Roswell, NM. When Vic sold that airplane, the new owner already had a trailer, so Vic's trailer was an orphan. I was happy to purchase it for my Series 6. Vic graciously included wing supports, tie-downs, and hardware in the purchase. 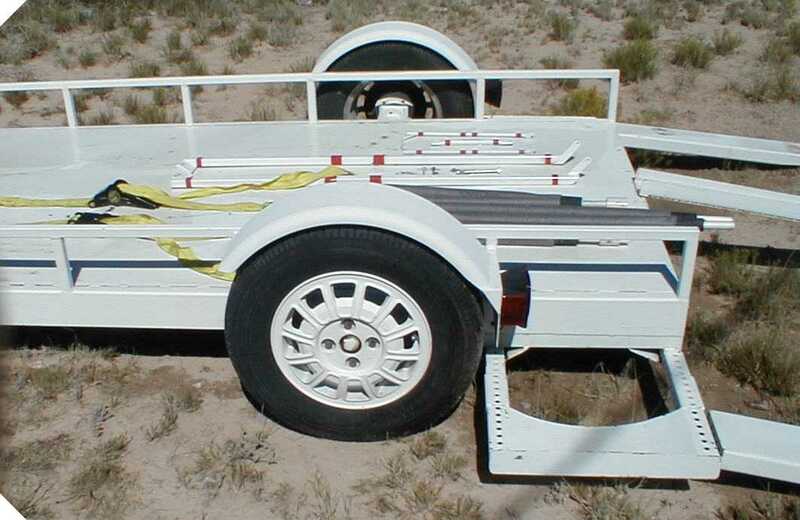 The trailer was designed specifically to carry a Kitfox. The aircraft is loaded tail first with the help of a hand winch. The main wheels roll into the trays just behind the trailer wheels. This gives the advantage of sitting low enough that the aircraft can be rolled into a garage while it is still on the trailer - no need to unload to get it through the door. 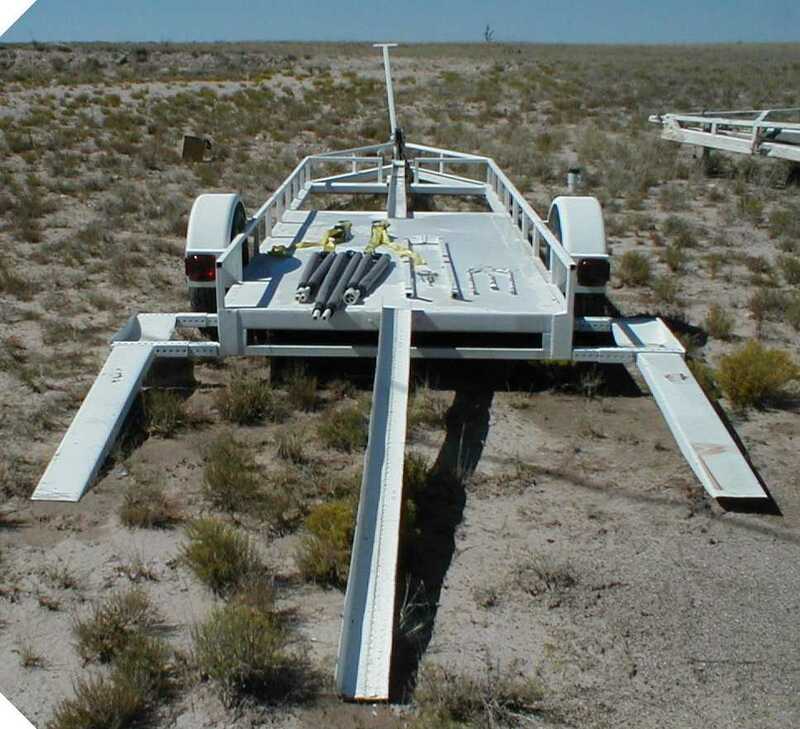 The aircraft is winched on to the trailer tail first and then the wings are folded. The aircraft is tied down and braced. Then, it is off to the airport. I took the trailer to the local welding shop for some minor modifications. My wing tips were uncomfortably close to my car's tailgate, so I lengthened the tongue 18 inches. I installed safety chains and the proper coupler for trailer lights. 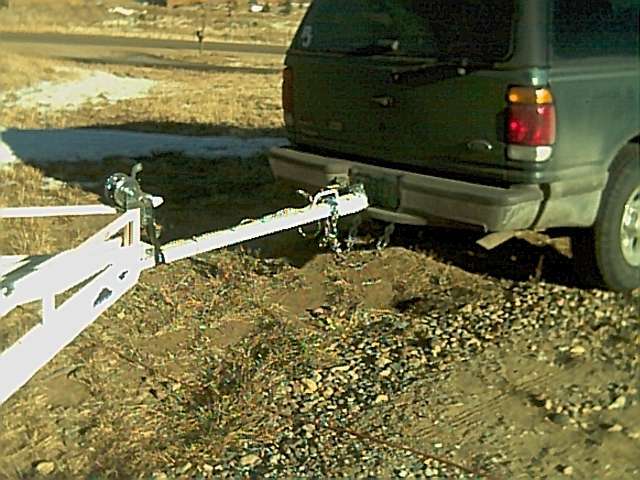 I have a dip at the end of my driveway, so the low slung trailer tended to drag when I pulled out. 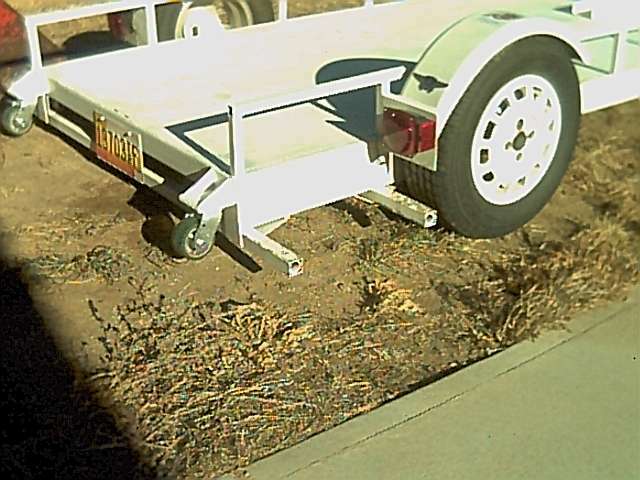 I added skid wheels to the back of the trailer to eliminate this behavior.